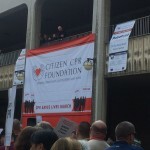 On Thursday, December 10, several HeartSine staff members were proud to march in Citizen CPR Foundation‘s CPR Saves Lives March in San Diego, California, part of the Emergency Cardiovascular Care Update (ECCU) 2015 conference. 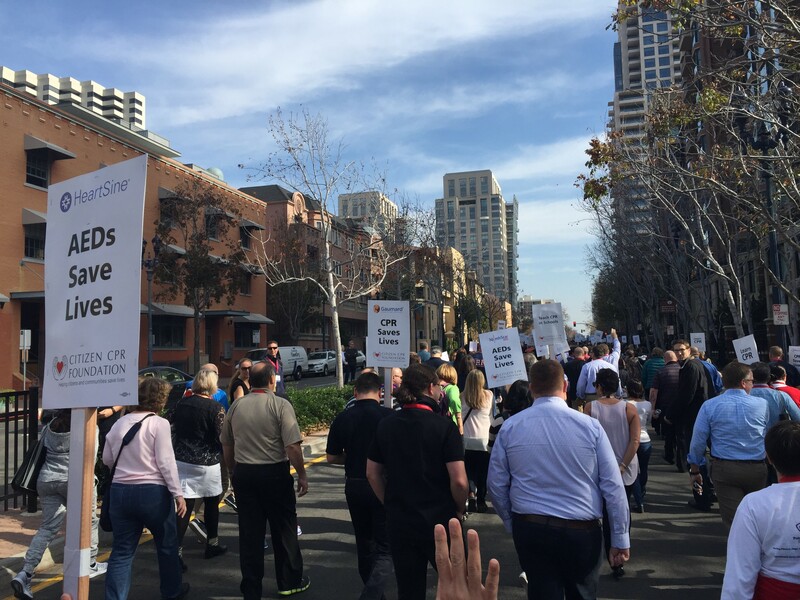 The purpose of the march was to raise awareness and increase survival rates of Sudden Cardiac Arrest (SCA) by stressing the importance of cardiopulmonary resuscitation (CPR) and the use of Automated External Defibrillators (AEDs). 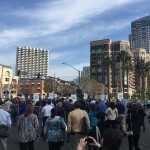 Over 1,200 participants & 50 SCA survivors participated in the march, which began at the Manchester Grand Hyatt and ended at the San Diego Civic Center. SCA is a malfunction of the heart’s electrical system, which causes it suddenly and unexpectedly to begin to beat rapidly, then erratically, and finally to stop altogether. According to an Institute of Medicine report, there are 1,600 preventable deaths in the U.S. from SCA every day. Effective CPR and the use of AEDs can increase the survival rate for SCA up to 75 percent. 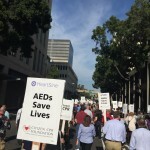 An American Heart Association study showed that for every minute defibrillation is delayed, the victim’s chance of survival decreases by seven to ten percent. After 10 minutes, typical SCA survival rates could potentially drop to zero without any intervention. The life-threatening condition strikes over six million lives per year globally, and with a survival rate of five percent or less, SCA is responsible for more deaths than breast cancer, lung cancer, and HIV/AIDS combined. 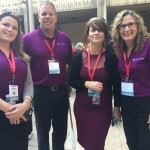 It occurs abruptly and without warning, with 84 percent of SCA events occurring away from a healthcare setting. Click here to learn about HeartSine’s line of lifesaving Automated External Defibrillators.